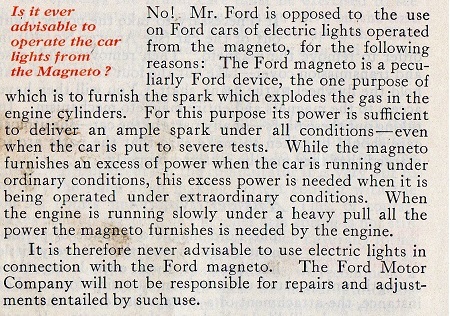 Model T Ford Forum: Magneto lights. Model T Ford Forum: Forum 2014: Magneto lights. A 1914 Canadian Ford Manual. It seems that Mr Ford had changed his mind the following year/model!! Though the magneto was indeed revised for more power at #572,437 in september 1914 - thicker magnets and oval coils. So he may have had the magneto lights in mind but couldn't recommend them for customers until the cars with a more powerful magneto were at the dealers.